Vox Lux is a movie that could easily make anyone uncomfortable. The opening scene starts with a teenager shooting up a school, murdering multiple people, including himself. 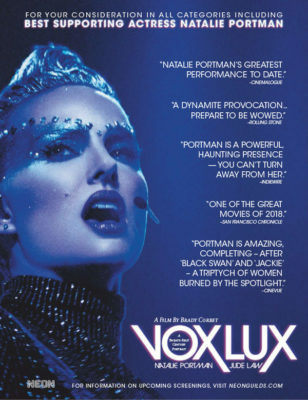 Vox Lux follows one of the school’s teenagers, Celeste, and her journey to stardom after this shooting. Slowly but surely, she changes from a kind-hearted Catholic girl to a corrupt primadonna. For the duration of the movie, you’re left feeling on edge, as though another shooting might happen at any moment, similar to how Celeste may feel for the rest of her life. Half of the movie is spent following teenage Celeste as she becomes a star and the other half following adult Celeste who has since spiralled out of control. There was a lot of narration that seemed unnecessary at times and the ending was left very open. Part of me left the theatre feeling like I wasted about two hours of my life. Things that were mentioned in the beginning were never brought up again and the last scene could have been much shorter. Natalie Portman played an excellent Celeste, but the movie itself could not be saved by her.